Weapons of war have come to the Finborough Theatre this autumn, as the theatre presents Tony Harrison’s Square Rounds. 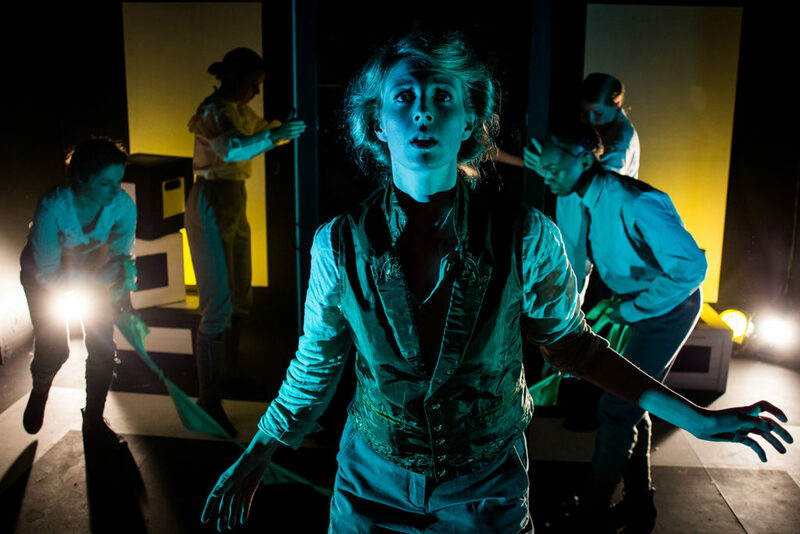 Set in 1915 in a munitions factory, Square Rounds brings the inventors behind such tools of technological warfare as the machine gun and poison gas back to life, as they’re played by the female munitions workers now tasked with bringing their destructive inventions into the world. In this guest blog, director Jimmy Walters discusses his process behind taking Harrison’s daunting piece on and how this nearly 30-year-old play is still just as relevant today. The first time I directed a Tony Harrison play was last year and it was The Trackers of Oxyrhynchus. Doing something so far removed from my comfort zone was both enticing and frightening. I suddenly realised that maybe it’s the fear that can really fuel you, so I made it my mission to constantly stage work that is both challenging and rewarding. Square Rounds is exactly that. 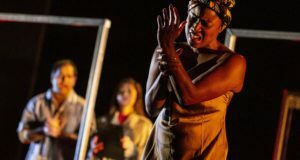 When [Finborough Artistic Director] Neil McPherson gave me the choice two years ago of directing Trackers or Square Rounds, I actually connected immediately with Square Rounds but I was daunted at the prospect of staging something so massive. However, after Trackers I felt ready and excited to give it a go. The relationship between science and war at the centre of Harrison’s play is something that had always fascinated me. In the case of Fritz Haber, his heroic achievement of extracting nitrogen from the sky to enhance fertilisation won him the Nobel Prize – but it also enhanced the development of gunpowder in war. The very thing keeping us alive was also the very thing destroying us. Similarly, Sir Hiram Maxim, who gave us the machine gun, also gave us the inhaler. One, a weapon the can annihilate several people at once; the other, a tool that can rescue one from near death. It’s an extraordinary examination into how light and dark work together in contrast without any grey areas and that is clear throughout the writing. 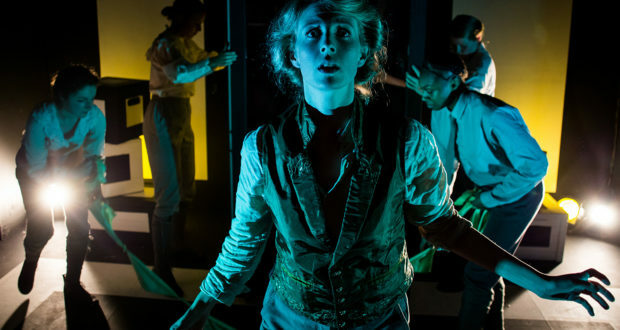 The play also takes the theme of gun control on, describing the machine gun as ‘the greatest lifesaving machine’. On a human level, we watch how power turns into madness and how an outsider in society can sell his soul to the devil, as Haber, who was Jewish, gets into bed with the Kaiser. Harrison explores how the power of inclusion and wanting to be accepted can severely affect one’s moral compass. Square Rounds is sadly more relevant today than when it was first unveiled at the National Theatre in 1992. Bullets were changed from round shaped to square in the Gulf War, when they were fired at Muslims so they would receive a slower, more painful death. Tony doesn’t hold back with throwing these facts of information at a modern-day audience; watching it, you become quickly aware that the world you live in today is just as an appropriate backdrop for the play as the early 90s were for the original production. the rockets fly faster and higher. We only have to look around the globe today to see the progress we have made from early conflicts; the problems still exist now, just with different weapons and under a new armour. With the line ‘the problem is now to find a way how’, though, Tony lets us know that he doesn’t necessarily have the solution. It’s always important to me when staging any piece of work to honour the playwright first and foremost, and Tony is one of the most powerful storytellers I’ve ever come across. On watching the first few performances it is unbelievably liberating to see Tony’s words come to life in front of an audience – even if it can be very frightening at first and feels a little like you are tilting on the edge of a cliff. All of us at Proud Haddock have been very grateful for all of the reactions we have received and as a journey of exploration it has truly been an incredible experience. Square Rounds is currently playing at the Finborough Theatre through 29 September.